Needless to say, the key to any successful enterprise is good planning and preparation–planning and prep down to the last detail–and that’s what the pre-production phase is all about. We were fortunate to have made an early connection with producer Mark Constance, who for many years had worked in L.A. as a second assistant director on major films like Being John Malkovitch. 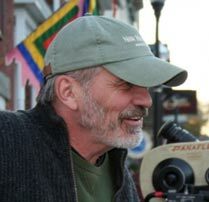 Some years prior Mark and his family had moved to New Hampshire, while he continued to work both coasts on films. When Aaron and I first met him at a small coffee shop in downtown Keene, we hit it off right away. Mark became “Mr. Prep” for us, serving not only as a hands-on producer, but also working as our production manager and all-around trouble shooter as we geared up for the shoot. For starters, Mark spent a good part of the pre-production weeks hiring on our excellent crew for the shoot, mostly from the Boston and Manchester area. Pulling this group of nearly sixty professionals together was no small feat and Mark, who seemed to have connections with just about every crew member working in the motion picture industry in New Hampshire and the greater Boston area, was able to convince the best of them to become a part of our team. Concurrently we had to find a way to house nearly 75 cast and crew members for three weeks in a small town and feed all of them two very good meals a day at one central location–all in such a way that it wouldn’t put a drag on the actual shooting schedule. We had to negotiate downtown parking for all of our large equipment trucks and mobile homes used by the actors. We had to find an adequate production office in a central location. We had to negotiate terms and conditions with the owners of every location selected for use in the film. We had to locate, hire and orchestrate the use of dozens of extras in various scenes. Traffic control issues had to be hammered out. The police department had to agree to partner with us during the shoot when inevitable disruptions of normal town life were bound to occur on a regular basis. I could go on, but I’m sure you get the idea. One lucky break we encountered at the start of pre-production was being able to totally book out every room at the Peterborough Manor Bed & Breakfast, a mammoth old rambling house on the edge of town, for the entire three-week shoot of the film. We simply took over the Manor and housed all our cast there. It turned out to be a wonderful plus for the film as the actors and Aaron, the writer/director (who also stayed at the Manor) could meet in the evenings after the day’s shooting and discuss the next day’s work. The Manor was also used as one of our main locations for the film. I think it’s awesome that you guys were able to not only use the B&B as a location but also to house the cast/crew. I think it would have help to give David Stathairn a permanent sense of his character’s surroundings during the entire production. Plus it’s cost effective to keep everyone close to the locations you are shooting so that you don’t have to keep travelling around and wasting gas, time and money. I know that it was difficult for some of our shoot because I was travelling with the cast/crew to some locations that were hours away. I can just imagine how quickly your budget could have ballooned if you had spread the cast/crew out in differnt locations for housing, then had to bring them to multiple locations hours away. I don’t think the average person even has the slightest idea how much goes into production until someone starts to describe it in detail. Look forward to the next post. What’s the ideal future scenario for filmmakers? Internet Consulting - Web Site Design and Development by Consensus Technology, Inc.